Have you not been watching Agent Carter on ABC? If you haven’t, the bad news is that you’ve made a terrible mistake. The good news is, it’s not too late to fix it. If you need a little more convincing, allow me to list several reasons you should be watching this glorious show. Fun fact: Peggy Carter can do 107 one-armed pushups. She’s totally buff and can deliver plenty of pain with her fists of fury alone. She doesn’t need to use everyday objects to beat the crap out of people; she just likes to mix it up every now and again. Say her undercover mission is lacking a little something, she’ll jazz it up by stapling one of her enemies in the face using the stapler from his own desk. Bad guy trying to escape? Allow Peggy to casually borrow someone’s briefcase and knock that loser flat before he can see what’s coming. In one particularly memorable scene, after watching a customer harass her friend Angie at the diner where Angie works, Peggy ever so casually grabs a fork and proceeds to quietly and discreetly threaten to murder him with it. She manages to somehow be very proper and polite about it and simultaneously the most frightening person to ever wield flatware. Speaking of Peggy Carter looking out for other women, let’s get to reason number two you should be watching this show. Peggy Carter is a badass and she will use the power she has to stand up for other women in ways they might not be able to stand up for themselves. Angie is perfectly capable and makes plenty of sarcastic remarks to Peggy about her more disrespectful customers. However, in order to keep her job, she has to put up with their verbal and physical harassment. If Peggy can make Angie’s life a little easier by threatening to slam a fork into a man’s brachial artery, then by God she’s going to do so. I think we can all agree that’s beautiful. Angie’s no slouch when it comes to supporting her fellow woman either. She thinks Peggy works at the phone company, not a top secret government agency, but Angie still thinks Peggy can and will be the best phone company employee ever and never misses a chance to encourage her. Peggy needs a little encouragement, since she gets her fair share of disrespect from the men she works with. Instead of being deterred by that, she uses it to her advantage. Need to sneak away for a secret undercover mission? What better way than implying to your sexist boss you have your period and need some time off? Peggy is a master at that trick. You want her to take your lunch orders? Okay, she’ll do so and giggle at how stupid you think she is while taking photos of your top secret lab with her awesome camera pen. Pretty much everyone underestimates Peggy. The second episode of the show features a radio show about Captain America’s adventures in which the Peggy Carter character (renamed Betty Carver) is helpless, constantly getting captured, and screaming for Captain America’s help. Peggy’s reactions to hearing the show are a running gag throughout the episode. Her competence and cunning are a stark contrast to Betty Carver’s helplessness and enthusiasm for doing Captain America’s laundry. It all culminates in a glorious scene where the real Peggy brutally fights an enemy as the radio plays Betty Carver pleading with her captor and wishing for Captain America to save her. Peggy Carter doesn’t need a superhero; she’s plenty super all on her own. Peggy isn’t a one-dimensional tough chick. The writing and Hayley Atwell’s stellar performance give Peggy real depth. Though she doesn’t often let those around her see her struggle, the viewer is privy to those private moments when it’s obvious Peggy feels the weight of the world on her shoulders. At the start of the series, Peggy is very much alone. Her life is defined in large part by absence. She’s lost the sense of purpose and respect she found during the war. She’s lost her love, Steve Rogers, a.k.a. Captain America. She hesitates to let anyone else in because she believes she’s a danger to those around her, a belief which is only reinforced by the events of the first episode. Edwin Jarvis, Howard Stark’s butler and Peggy’s sometimes partner in spycraft, reminds Peggy, “There is not a man or woman, no matter how fit he or she may be, who is capable of carrying the entire world on their shoulders.” Peggy does her best to keep people at arms length and to carry the weight of the world; the toll that takes on her as well as the way she fails to maintain that distance and begins to allow some of the people around her into her life makes for compelling viewing. So, you haven’t watched any Marvel movies or read any Marvel comics? That’s fine! This show is completely accessible and entirely enjoyable for non-Marvel fans. Tune in and enjoy the heck out of this rad 1940s spy show. Do you love Marvel comics and/or movies already? Oh, man has this show got some awesome stuff in store for you too! Get to better know Howard Stark, Tony Stark a.k.a. Iron Man’s father and one of the lead scientists in Captain America’s development. Spend some quality time with Edwin Jarvis, the predecessor to Tony Stark’s computerized J.A.R.V.I.S.! Want a glimpse into the school where Black Widows are created or want to see The Howling Commandos again? Agent Carter has got you covered! Do you like Marvel’s other TV show, Agents of S.H.I.E.L.D.? That show could exist without the badass that founded S.H.I.E.L.D. Who was that again? Oh yeah, IT WAS PEGGY CARTER. Agent Carter is a good old fashioned spy story. In addition to the multitude of fabulous things I’ve already talked about, there are car chases, undercover missions, fist fights, gun fights, cool spy gadgets, witty banter, sweet 1940s fashion, humorous moments, and the type of suspense and action that will have you on the edge of your seat and possibly even shouting at your television screen. There are also compelling stories, relationships, and characters. Just tune in and see for yourself. You have my solemn promise that you shall not regret it. 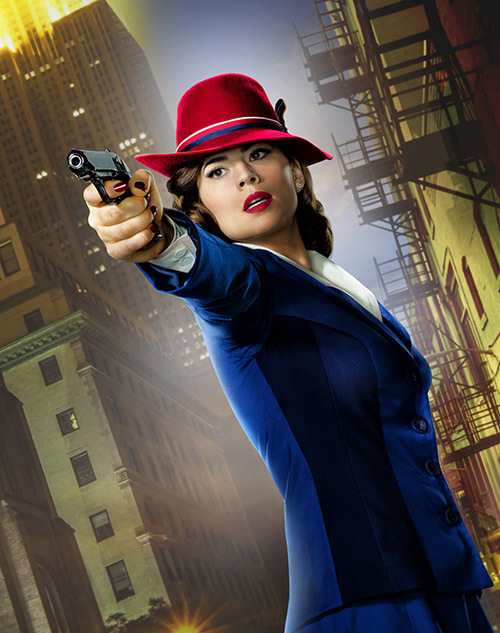 This current season of Agent Carter is set to run for eight episodes. As of the writing of this article, five episodes have already aired. US viewers can catch up on the show on ABC’s website, ABC On Demand through their cable provider, Hulu, Vudu, Amazon, or iTunes. New episodes air Tuesdays at 9PM EST/8PM CT on ABC.